In this English speaking practice lesson with your new English Trainer Jenny, you will learn some interesting Short and smart English phrases that are used in your Everyday conversation. 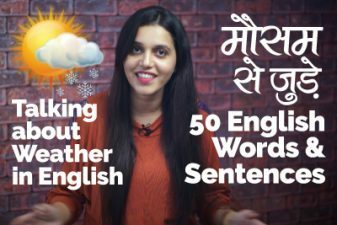 These English phrases would make your sound fluent in Spoken English and add a pinch of style to your English conversation. People who speak fluent English often use these phrases in their conversation. Our free English speaking practice lessons are intended to make you fluent in Spoken English and learn English faster and improve your English fluency for Jobs and social situations. I have to say you have a beautiful house. I have to say you are no less. I have to say you have a sharp memory. I have to say you are a fabulous dancer. I have to lose my weight, come what may. I have to pass the exam, come what may. I will never leave your side, come what may. You have to attend my wedding, come what may. Sooner or later you will get caught. Sooner or later he will surely realize my importance. Sooner or later you will have to marry. Are you kidding me? I’d die without coffee. Sorry, I was just kidding. Would you like to come out with me for lunch? Are you kidding me? I have a lot of work pending. You can still complete your project as it’s never too late. You can start reading again as it’s never too late. Buying a house is easier said than done. Training people is easier said than done. Reading a human brain is easier said than done. Get rid of this job. Kindly get rid of smoking and drinking alcohol. It’s all by God’s grace. By God’s grace my brother got saved from an accident.